I still don't have a band or a photographer picked out for my March 2011 wedding (insert mini panic attack here) but I have moved my attention to the invitations. I'm pretty sure I will end up making them myself, aka getting a few things printed and assembling all the pieces and adding pretty details. I figured I would focus my attention on the outside of the envelope to start. The calligraphy, typeface, fonts...whatever you want to call it. I'm using these beautiful examples as my inspiration. To say I'm obsessed with this calligraphy is an understatement. Love the last one, I'm thinking either an orange or blue envelope with white writing. Also, what do all of you think about the double envelope thing? Is that still the 'proper' thing to do, or is that outdated? So many things to think about JUST for the invitations. My wedding to-do list seems to be getting longer and longer....and longer. Let me know if you want the name of my photographer. She's priced pretty reasonable and she did a fantastic job. The whole double envelope thing was really started as a way to keep the invitation looking nice and formal, as it got processed through the mail. I am sure you could skip it! I used this woman for my calligraphy: http://www.heartstringsdesigns.com/ Her prices were DIRT cheap compared to anything in Boston! They turned out stunning! They will look beautiful! I love the vintage stamps. I love the zip code in the last one, would look nice in a peachy or yellow color with a gold pen! If you don't have the second envelope you may not get as many RSVPs. 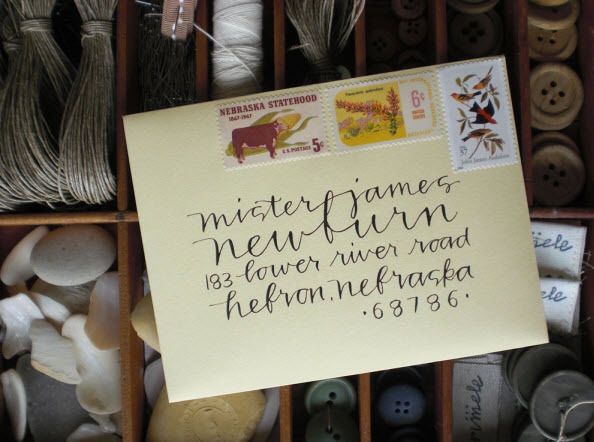 I have a friend who is a wonderful photographer - and if I lived nearby, I would be happy to help address envelopes. I love the double envelope. Maybe you could use both colors. Navy on the outside and Orange on the inside. Patricia, I love that idea! Getting both colors in there would be great! I have a great idea for you! Viive told me that you can design your own U.S. Postage Stamps! She sent some as an engagement present to her friends with their initials of them. They were beautiful! I love the last envelope! What a beautiful style. 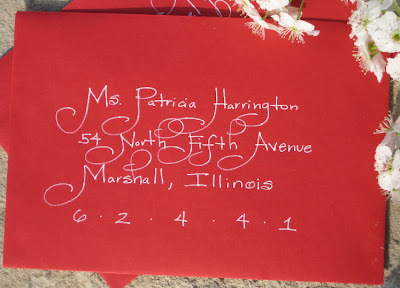 We ended up printing addresses on our invitations but we used a font that was very much like calligraphy. It looked great and it was a good way to save a little money on the wedding. I think you can do whatever you want when it comes to one or two envelopes! We used a very thick long card for our invitation so we only used one envelope. I love Patricia's idea! wow, you will write them yourself!? Im sure they will turn out amazing!! All beautiful, but I like the last one too. Something so fresh about it. Wow, I love the second one, it is gorgeous. They all are, the script looks "fancy" while being fresh. I really like the last one, it is updated calligraphy. Just found your blog, brings me back to when I planned my wedding. I designed my own invites before there was all of these great paper products (I MADE my own envelopements!) love pve's advice on the envelope colors. --Gretchen O. Love these! 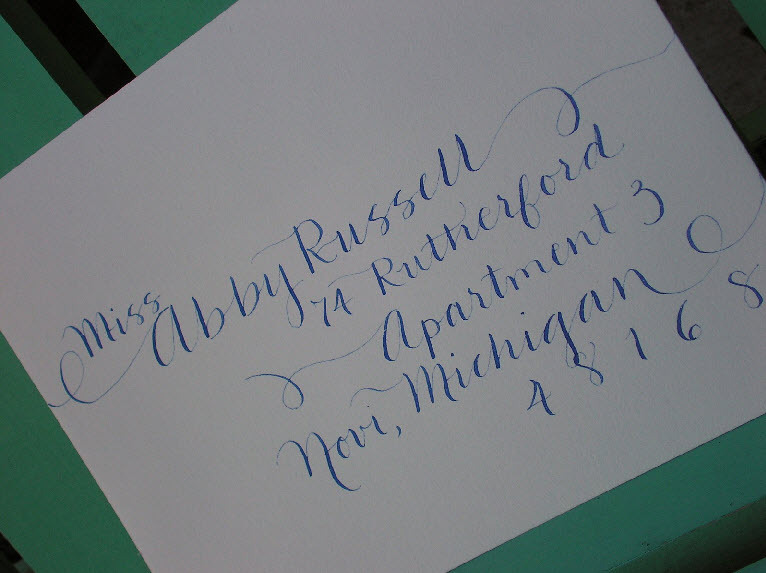 I found a photographer who's trying to get into calligraphy and she's doing mine for a super price. Let me know if you want her name! Love these, and I know you're invites are going to be awesome! I'm also getting married next year (May) and have really loved seeing the use of old stamps. I've started buying up dozens of floral stamps from Ebay (very cheap...check it out) for our formal invitations. It will really add a one-of-a-kind look. Good luck with your planning! I am a firm believer in the double envelope (if one can be a firm believer in something that trivial...) You don't want your perfect invitations janked up by the postal service! Also, I love the calligraphy in the second photo. How fun! I can't wait to see what you end up with. I was the same about my wedding invites, super excited. so pretty! I love this idea, they are all adorable! good luck! theres a girl here in Minneapolis who owns an etsy shop that does stuff like this... her shop is called lettergirl- its super cute stuff! 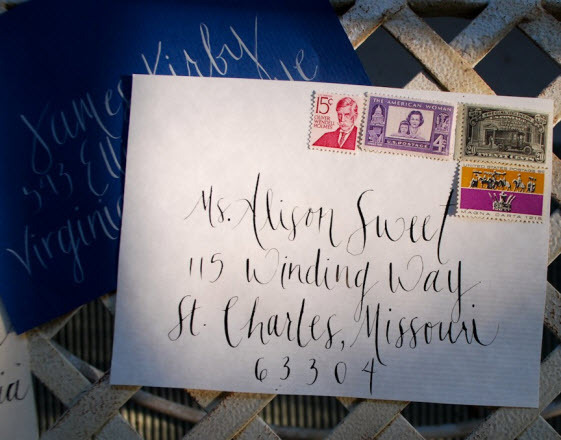 Double envelope is the way to go if you're having a formal wedding. Plus, then there's more room for calligraphy! Super cute! I love the writing on the last envelope! I can't wait to see how yours turn out! 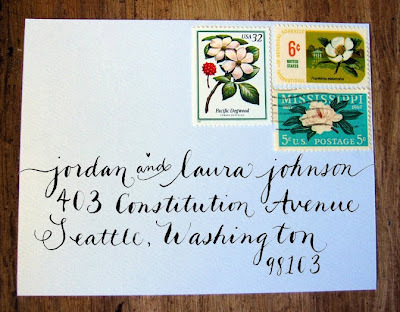 I wish I had beautiful handwriting like that. Such beautiful stationary. Of course I LOVE all of the inspiration! I'm here for a helping hand! I love #1 and #3..gorgeous! good luck!